Religion has always been a delicate subject to discuss, considering the fact that people have their own set of opinions and beliefs. However, it is still good to learn about other people’s religions, so that we can treat them better, and more importantly, respect their own beliefs. You might be surprised at how people, despite having different religions, actually have the same beliefs in most aspects of life. Here, we will take a look at the difference between Islam and Judaism. What are the key differences between the two? Islam literally means submission to God. It is a religion which follows the teachings found in Qur’an, the book that gives the teaching of Allah, their God. They also follow the teaching of the prophet Muhammad. Those who practice Islam are known as Muslims, meaning, ‘one who submits’. They consider their religion to be the completed and universal version of monotheistic faith. Similarly, they follow the five pillars of Islam, which refers to the five duties that unite them as a community. Islam is the second largest religion in the world, and is predominant in the Middle East, North Africa and a large part of Asia. Judaism, on the other hand, is a religion which centers on the principle and ethics found in the Hebrew bible, known as Tanakh. It is believed to have started at the same time as the covenant of God and Abraham. Jews all over the world may practice different forms of Judaism, but the focus will still be on their core belief. That is, belief in divine revelation and the acceptance of the written and oral Torah, or Jewish Laws. Traditionally, Jews living in Muslim lands are given privileges to practice their religion, but are subject to certain conditions. This creates a complex relationship between Islam and Judaism. Jews lead an inferior status under the Islamic rule. 1. Islam is the religion followed by Muslims, while Judaism is followed by Jews. 2. Islam’s teaching is based on the Qu’ran, while Judaism’s ethics is a pattern from Tanakh. 3. Islam is governed by Allah and Muhammad’s teachings, while Judaism is rooted from the covenant of God and Abraham. Mabelle. "Difference Between Islam and Judaism." DifferenceBetween.net. May 19, 2011 < http://www.differencebetween.net/miscellaneous/difference-between-islam-and-judaism/ >. i agree for jewish people were treated equaly, yet, its what the jews created themselves in islamic land which is what lead to such positions described above. Do you know that there is NO word ” Jew ×™Ö°×”×•Ö¼×“Ö´×™â€Ž ” in the so called five books of Moses? â€¢When and How Was the Jewish People Invented? It is an invention Called ‘The Jewish People.There never were Jewish people. Wow, that was a truly ignorant comment. Clearly, you have a lot to learn about Hebrew. The words, Judah, Yehudi (Jew), Israel (the people), Eretz Israel (the nation), Israelite, Jacob (also meaning Israel as the name was changed to represent Israel, are all in the (not “so called” but actual) five books of Moses which constitute the Torah. All of these words are descriptors are Jews. The Question is.. HOW [YHWH â€¦×™×”×•×”â€Ž]became the personal name of GOD NOT..[I am (who) what I amâ€¦. ××”×™×” ××©××¨ ××”×™×”â€Ž]â€¦???? 2)If you think Judaism is rooted from the covenant of God and Abraham, ..
the Question is where does it say that?…where the word â€ Jew ×™Ö°×”×•Ö¼×“Ö´×™â€Ž being mentioned in the Covenant of Abraham? Do you know that there is NO word â€ Jew ×™Ö°×”×•Ö¼×“Ö´×™â€Ž â€ in the so called five books of Moses?When and How Was the Jewish People Invented? 1) You seem to have conveniently left out the very next verse. 2) Yehudi, means from the tribe of Yehuda. In the five books of Moses, the People of Israel included all twelve tribes, not just the Yehuda tribe. After the northern kingdom (comprising ten tribes) was exiled, the Jews began to be referred to as Yehudim. Yehudim are mentioned in the book of Kings, Jeremiah and Esther amongst others. as per our book Quran. The Qur’an warned us that the Jews would stab us in the back two times. After which Messiah Jesus and Mahdi will return and establish peace on Earth. The first was probably when some Jews helped the Crusaders at the promise of a piece of the Holy Land. The second was in 1948, when the Palestinians allowed the European Jews shelter in their land, and were kicked out in return. “I Am that I Am”-ʾehyeh ʾasher ʾehyeh: the most important reference to the Jewish God is found in the Qur’an. Allah is Ya Hayu Ya Qayum: The Ever-Living, the Sustainer of [all] existence. YHWH could be derived from this root(HaYa). Our God is One! In order to know real difference between these two we must click the following 3 links to be sure with authenticity as to which of this religion is correct and acceptable. Yes we have seen the peacefulness of jews in palestine and labanon. Now dont try to tell me that palestine is your land. @james cagle. 100% agree with you. All the trouble in the Middle East is created by so called “peaceful ISRAEL”. All the tension and danger of World War exists only because of Israel. She mend her ways and learn to live peacefully. I’m neither Jewish or Muslim, however i am taking a world religions class this semester in college. I was doing research for a paper I’m writing on the differences between Islam and Judaism which is how i stumbled across this thread. I must say, the hatred within all of these comments is a shock to me. If i’m not mistaken it’s a part of the Qu’ran and Tanakh to follow a certain set of moral and ethical codes which I assume have been broken within this thread. My best friends growing up were Jewish and Muslim while i was a confused christian and now agnostic. We never got into any arguments about beliefs though and were able to love each other regardless of differences. We were actually able to learn more about each other beliefs and respect each other as a result. I’m just saying, the hatred is not necessary. If you are not secure enough in your own beliefs to be able to learn about others without getting offended than you should look at your own faith, not degrade someone else’s. that is a cowardly move my friends. We can be better than that. Thank you and may Gods peace be with you. 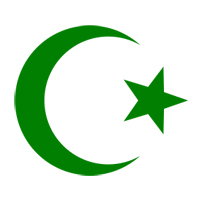 I am an Arab, also a Muslim Allah is a literal translation of God, he is not different than the Christian and jewish god, Mohammed was the prophet that came after Jesus, and in the original bible in the final verses there was a preaching about how a prophet named Ahmad “another name for the prophet Muhammad” would come and continue the wills of God, there was also a telling that when Mohammad was a young boy he went on a trading trip with his uncle and stopped by some Jewish people, an old man recognized the birthmark that was on Mohammad’s body as it was a mark mentioned in the torah too, the mark meant that he is the final prophet God would send upon his people. I agree with Nathan, I am a firm believer in God, Allah, YHWH. A rose by any other name is still a rose after all. If there is only one God, than everyone who believes in God at all, whether it is one or many, believes in that one God whether they are aware of it or not, because only one truly exists. The whole point of belief and faith, is that we are not certain of what we think we know to be true, therefore how can we judge, or dislike others, for what they think they know to be true. Maybe their knowledge is more true than ours, of this we cannot know, otherwise, it would not be a belief. @ Robert – Islam is a peace loving religion and Holy book Quran teaches to respect all religions including but not limited to Judaism and Christianity. Even though in countries where there are majority of Muslims, it is responsibility of the Government and people at large to protect minorities and respect their belief. @ Nathan – There is no argument of belief here. When someone corner a Muslim religion or any other religion who are oppressed and cannot defend themselves, the outcome / result is very much on the wall. In order to survive, they have the right of self defense and in this process if casualties occur from the other side, they must accept it. We see lot of Muslim blood-shed around the world these days and of course they have the right to defend themselves. Taliban and Al-Quaida are the by-product of this self-defense doctrine. I am not advocating terrorism but how an oppressed person react to attack on them. Mumbai and Gujrat Muslim Massacre and elsewhere all adding up to injuries and building up a volcano due to erupt sooner rather than later. Gaza Massacre in the hands of Israelis is one just glaring example on which the whole world is silent – what a pity. You must read between the lines. The ones who are oppressed need sympathy and kindness to live like brothers in this world to avoid blood shed and creating of new pressure groups for revenge. I know this post is old , but the article doesn’t properly answer the question – difference between Judaism and Islam. 1. Judaism is on the right but not completely right , now for example , let’s take the most fundamental pillar of Islam – the one true God ..
Jews beleive God is in the image of man , he needs rest ( after six days) etc .this is not true in Islam , Allah is great and nothing compares to him . So in Judaism God is belittled , but not in Islam .. this also applies to other aspects of the religion which I have no scope to write here ( require a book)..
2. Judaism was for a particular race stationed in a particular land for a specified time …Abraham did not teach Jews how to pray , fast etc it was Moses ..whilst Islam is for ALL races , for ALL lands and until judgement day ( after judgement day , Muslims can drink alcohol in paradise , hence Islamic laws will not be applicable ).. so islam is global , whilst Judaism is local ..so to make a long argument short , Jews should follow the global standard ..as Islam is a sole successor to ALL monotheistic religions..
Look around , the mosque compound has stood on Temple Mount far longer then any temple which ever stood there .. Jews were given 2 clear opportunities to rebuild their temple ( Julius and Persians ) , yet the lord denied it to them , when Muslims conquered Jerusalem , there was no bloodshed and the ppl peacefully submitted .. whilst the modern state of Israel was built on the back of broken promises , murder of innocents and theft .. how unholy !!! I can write a book , but let it be warned that Allah will question us on judgement day and he is not stupid !! !